In science there exists a uniquely potent partnership between theory and engineering. It's what's given us atomic energy, the Large Hadron Collider and space-flight, to name a few of the more headline acts. The theorists say: "This is theoretically possible." The engineers then figure out how to make it work, confident the maths is correct and the theory stands up. These camps are not mutually exclusive of course. Theorists understand engineering. Engineers draw on their deep understanding of the theory. It's normally a pretty harmonious, if competitive, relationship. Yet occasionally these two worlds collide. The theorists say something is just not possible and the engineers say: "We're going to try it anyway - it's worth a shot." There is one field of science where just such a contest has been raging for years, perhaps the most contentious field in all science/engineering - gravity control. When, in the late 1980s, the aerospace engineer Dr Ron Evans went to his bosses at BAE Systems and asked if they'd let him attempt some form of gravity control, they should probably have offered him a cup of tea and a lie down. Gravity control was a notion beloved of science fiction writers that every respectable theoretical physicist said was impossible. As Evans himself admits, it was a tough sell. "Let's be clear - there were many people in the company who felt we shouldn't do it because we made aeroplanes and this was highly speculative." Pushing against gravity with wings and jets was BAE's multi-billion pound business, why dabble in scientific heresy? Because, as Evans puts it: "The potential was absolutely enormous. It could totally change aerospace." If it was possible to make gravity push instead of pull, they would have a potentially infinite - and free - source of propulsion. It would put BAE Systems at the forefront of the greatest technological breakthrough since the invention of powered flight. It might just be worth a small punt. They asked Evans to go away, consult with his colleagues and come up with some concepts. He brought them a drawing of a vertical take-off plane, powered by an as-yet non-existent "gravity engine". He worried it didn't look visionary enough, so he asked the artist to add some green rays emanating from the plane - a green glow. When Evans's bosses decided to give him a small budget and an office, Project Greenglow was born. "It was incredible, everyone was captivated by what we were trying to do. We were overwhelmed." Evans soon discovered he was able to call on engineers at leading UK universities to help with the research, and it wasn't just academic curiosity. Like BAE, everyone was looking for the next propulsion paradigm. Wings and jets had reached their limits. In the US, Nasa aerospace engineer Marc Millis began a parallel project - the Breakthrough Physics Propulsion Program. Nasa had committed to getting beyond the solar system within a generation, but knew conventional rockets would never get them there. According to Millis: "If you wanted to go to our nearest neighbouring star, and say you want to do it in 50 years, you're having to go at a tenth of the speed of light. Well, the amount of propellant you'd need for that journey is about the mass of our entire sun. We needed something radically different." Like Evans, Millis was told: "To think radical, and think big." Out of the blue, a Russian chemist called Dr Eugene Podkletnov claimed he'd stumbled on the answer by accident. By using rapidly spinning superconductors Podkletnov claimed he'd managed to create a "gravity shield". Around the world, gravity labs like Greenglow and Nasa jumped on the news and tried to replicate Podkletnov's "breakthrough". They failed. In Dresden, Dr Martin Tajmar is testing a number of possible avenues. "Anti-gravity is a kind of synonym for saying, 'I'm trying to do the impossible, yeah'. But always be ready for the surprise," says Tajmar. Yet to theorists like Dr John Ellis, at Cern, it was no surprise when nothing came of it: "So this guy had the idea that by messing around with superconductors he could change the strength of the earth's gravitational field? Crap!" First of all, there was the big, big problem of scale. As Dr Clifford Johnson from the University of Southern California puts it: "We tend to think of gravity as very strong - after all it's what binds us to the earth. But actually of all the forces we know in nature, gravity's the weakest. "Let me give you a number. It's 10 to the power 40 times weaker than electromagnetism, that's a one with 40 zeros after it!" It seemed that even if one could manipulate gravity in the lab, there was almost nothing there to create any meaningful effect. Image caption USC's Cliff Johnson: "Of all the forces we know in nature, gravity's the weakest"
Recently it was discovered that the universe was not just expanding, but accelerating in its expansion, and suddenly the theorists had some explaining to do. According to Dr Tamara Davis from Queensland University: "Something's accelerating the galaxies away from each other. Gravity appears to be 'pushing'." Some theorists are now breaking ranks to offer radical explanations, among them Dr Dragan Hajdukovic at Cern, who has developed a theory that gravitational polarity does exist. He says: "So far, we believe that gravity's only a force of attraction. It may be that gravity can also be a force of repulsion but not between matter and matter but between matter and anti-matter." It's a theory Cern is gearing up to test next year. 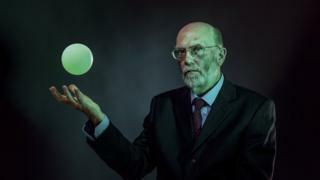 If Hajdukovic can show that anti-matter particles fall "upwards", he not only opens the way to some form of demonstrable anti-gravity on earth, he almost certainly wins a Nobel prize into the bargain. Other even more outlandish proposals are now on the table. For example one idea championed by Tajmar is to use a purely conceptual substance - "negative mass". Theoretically when negative mass is brought into proximity with positive mass it would create a powerful repulsive force - an infinitely accelerating drive, or to borrow from Star Trek, a warp drive. Johnson is quick to point out the theoretical problems - it would effectively invert Einstein's accepted model of universal space-time and create a runaway physics nightmare. Davis's objection is more practical: "[You had] better hope the people you want to visit in your warp-drive spacecraft are people you don't like because you'd annihilate them in the process of getting there." Now there are theories of how anti-gravity might work, it's the engineers who seemingly cannot provide practical ways to bring them to life. One device survived, almost unnoticed, from the Greenglow days - a propellant-less electromagnetic or EmDrive, created by British aerospace engineer Roger Shawyer. What sets the EmDrive apart from other concepts? As Shawyer puts it: "We're no longer looking to control gravity itself. We're beating gravity the smart way." Because the EmDrive actually appears to do something. In tests, it seems to move under its own steam. Shawyer claims his concept uses a known property of microwave energy called "cut-off" to generate thrust. According to Shawyer, the conical shape of the closed box causes the microwaves to effectively stop at one end of the cavity, while continuing to vibrate against the other, creating a difference in pressure. With a solar power supply, Shawyer claims he would be able to accelerate the EmDrive in any direction almost continually. "You would suddenly have a lift engine, which simply hovers there, or indeed accelerates upwards. So you can envisage launching large payloads into space on an EmDrive-driven space plane." The theorists are deeply sceptical of these claims because the EmDrive seems to defy Newton's law of conservation of momentum. John Ellis at Cern is particularly scathing: "With the EmDrive, unlike a rocket, nothing comes out of it. So I don't see how you can generate momentum out of nothing." Is rocket science easier than you think? Does Einstein's general theory of relativity still matter? Yet engineers like Ron Evans are predictably unrepentant: "My view is, who cares? It's the experiment that counts. If the experiment works, it's up to the theoretical people to put a theory round why it works." As the saying goes - watch this space.